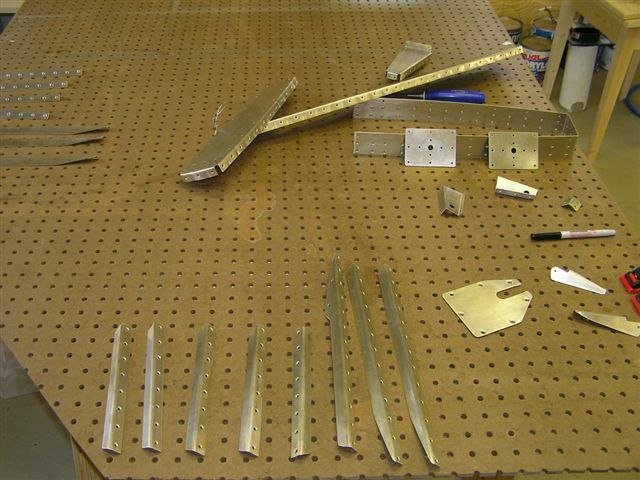 2/25/06 Cut out all the stiffeners and smoothed those needed for the right elevator. 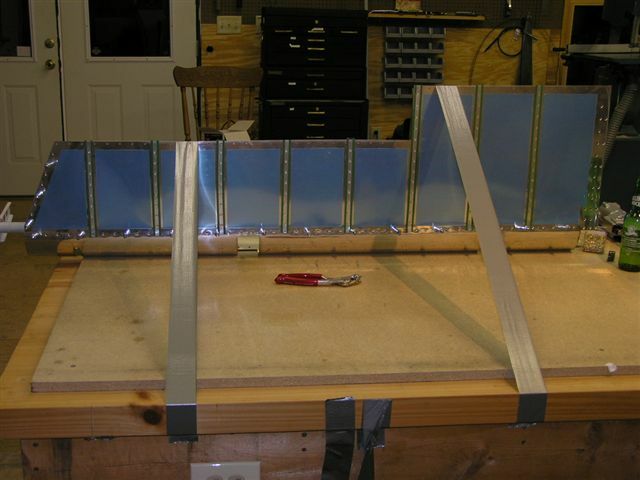 I used duct tape to hold open the skin and clecoed the stiffeners. 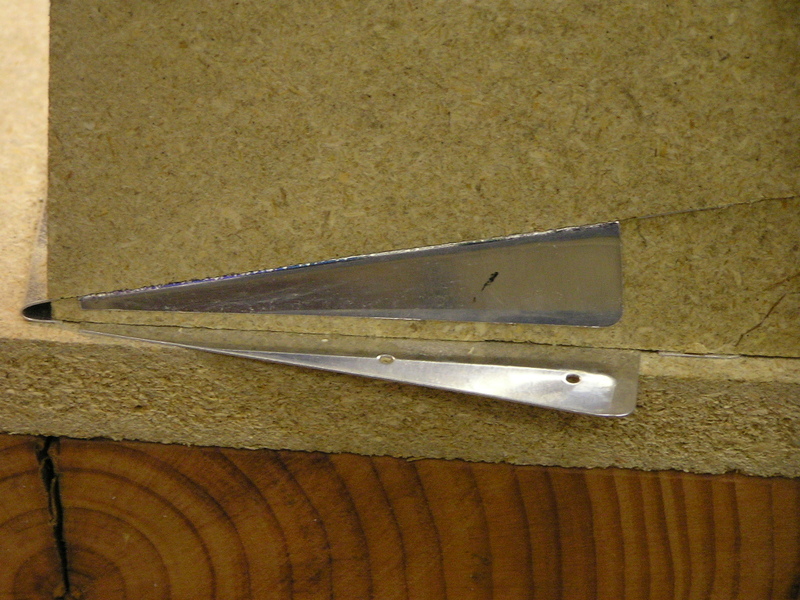 After match drilling the stiffeners to skin I flipped the skin over and repeated match drilling the top stiffeners. 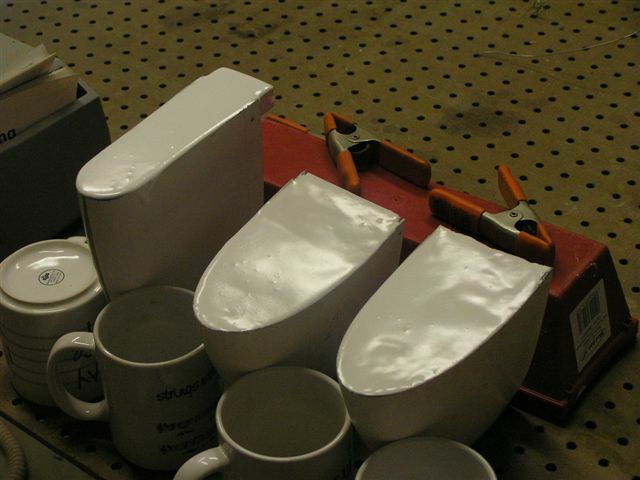 Deburred the stiffeners. Here you can see my technique for holding the skin open for deburring. I will need to recruit some help in order to dimple the skins (not enough hands). 2/26/06 Deburred the right elevator skin. 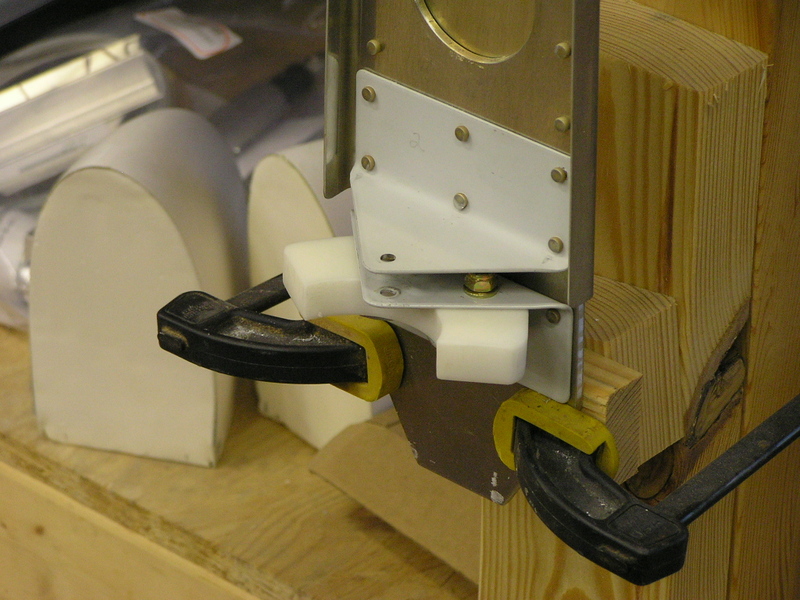 I assembled the end ribs for the counterbalance, fluted and match drilled. I beveled the outside edges of the counterbalance skin where the skin overlaps. Dimpled the stiffeners. 3/10/06 Dimpled the counterbalance ribs and skin, dimpled the trim plate and deburred both skins. Match drilled the back plates to the Rt. 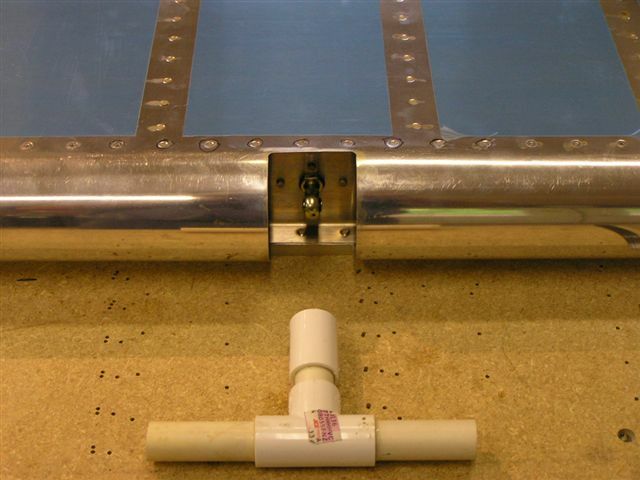 elevator spar and deburred. 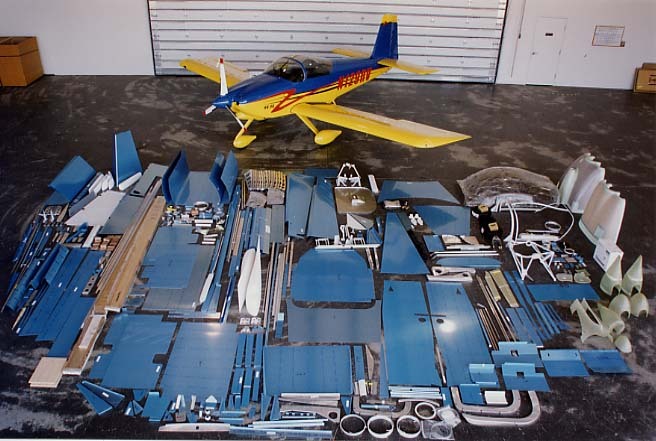 I bought the 8oz kit of T-88 from Wicks Aircraft Supply for the trailing edges of the rudder and the elevators. 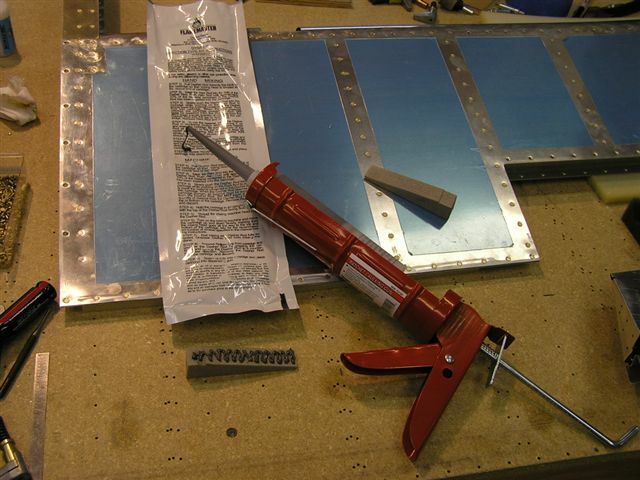 The ProSeal has only an hour life once you mix the parts together and I realized I would not be able to use it for both the rudder as well as both elevators. Oh well, maybe I will be able to use it to glue the ribs in the trim tab. 3/11/06 My flying partner, Jerry, flew up today to check out my progress. He helped me dimple the Rt. elevator skin. 3/26/06 Riveted the stiffeners to the Rt. elevator skins. Sanchem the spar, ribs and counterbalance arm. 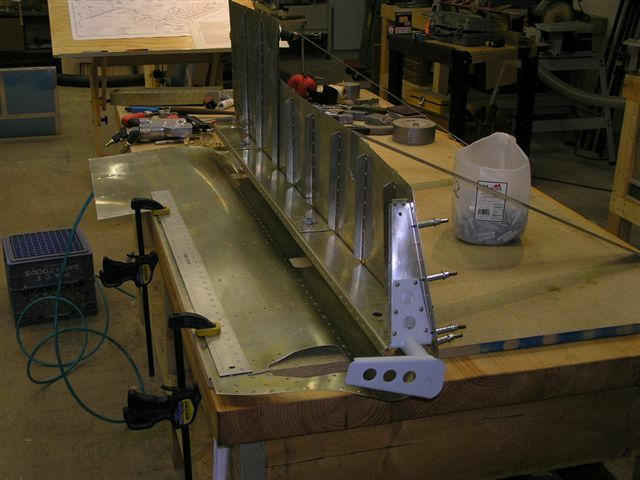 Riveted the support brackets and the end rib to the spar. I was riveting the counterbalance arm ribs and created this nice "smiley", so I called it a day. 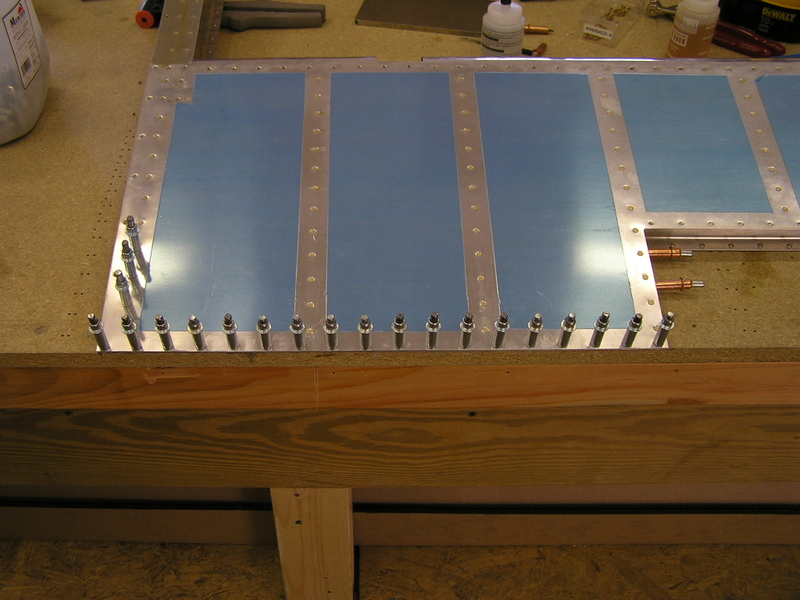 4/2/06 Riveted the spar to the top skin, the counterbalance assembly to the spar, and the bottom skin to the spar. Riveted the root and tip ribs to the skin. 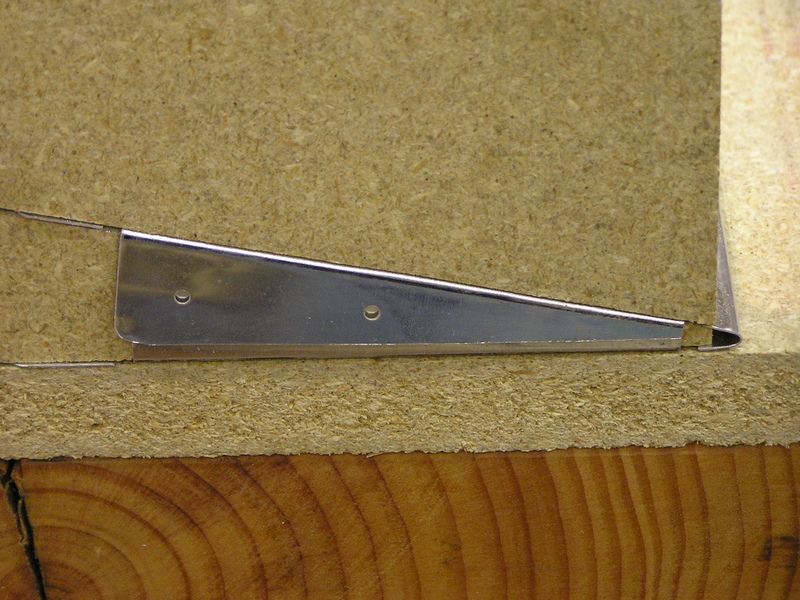 Drilled the AEX wedge to the trailing edge, deburred, dimpled and countersunk the AEX wedge. 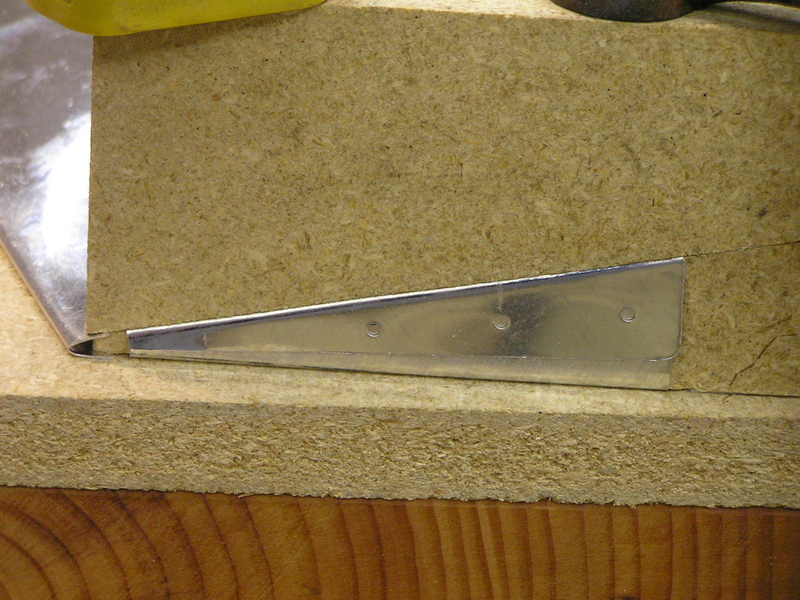 Drilled entire trailing edge to the aluminum angle. Took the assembly apart and glued AEX wedge with T-88 epoxy, clecoed the assembly to the angle and set aside to cure. 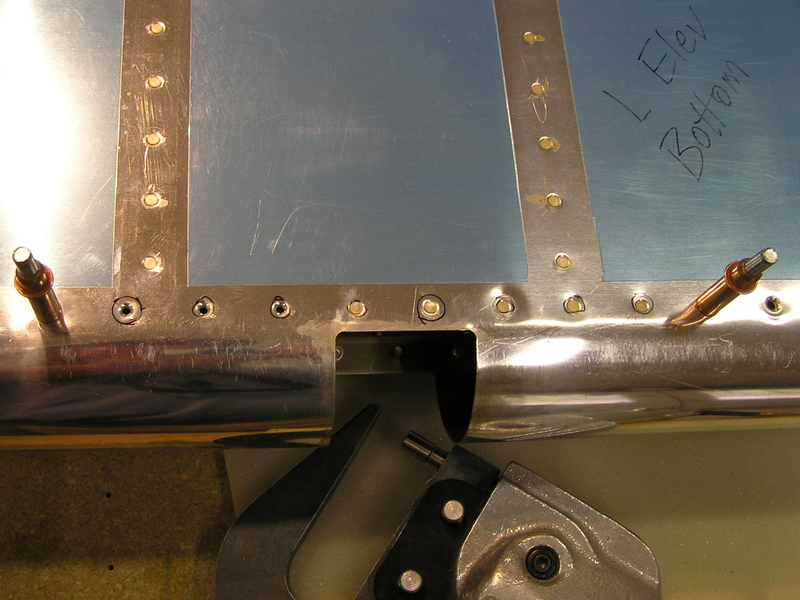 4/8/06 Removed clecos and cleaned rivet holes in trailing edge. 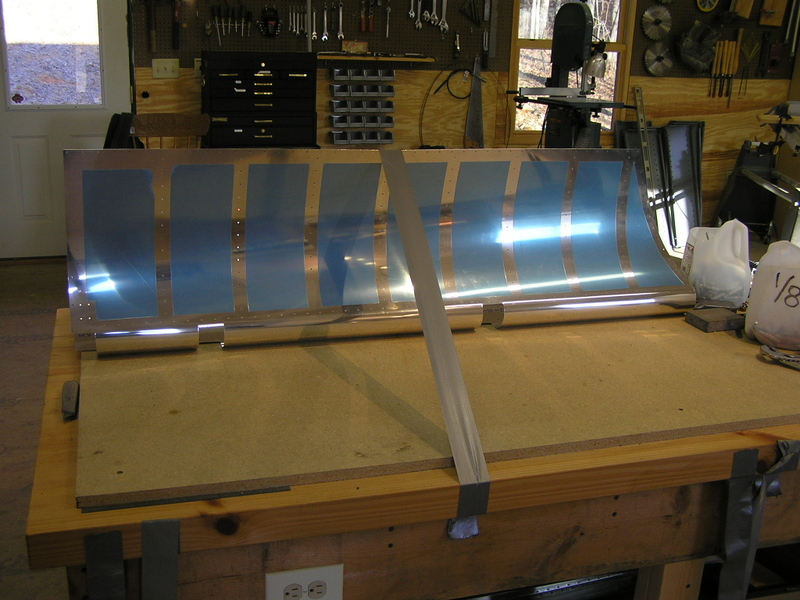 Back-riveted trailing edge (half way) being sure to alternate sides, flipped elevator over and riveted the trailing edge using the steel angle as a bucking bar. It is straight as an arrow. 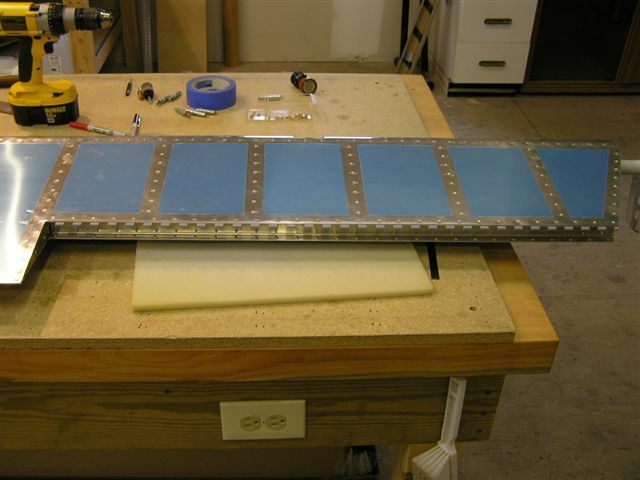 Installed the rod end bearings and installed the elevator to the horizontal stabilizer. Aligned and checked for fit, clamped and drilled the hole in the elevator horn. 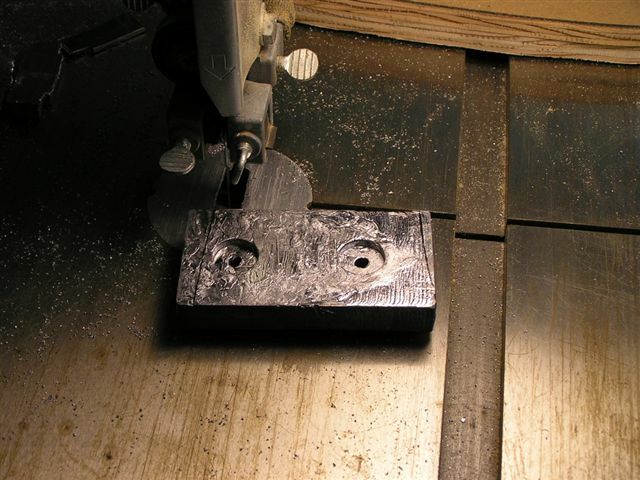 I found a 1/4" OD x 1" aluminum spacer at Home Depot to use as a drill bushing. I had to take off about .001" in order for it to fit snugly inside the VA-146. 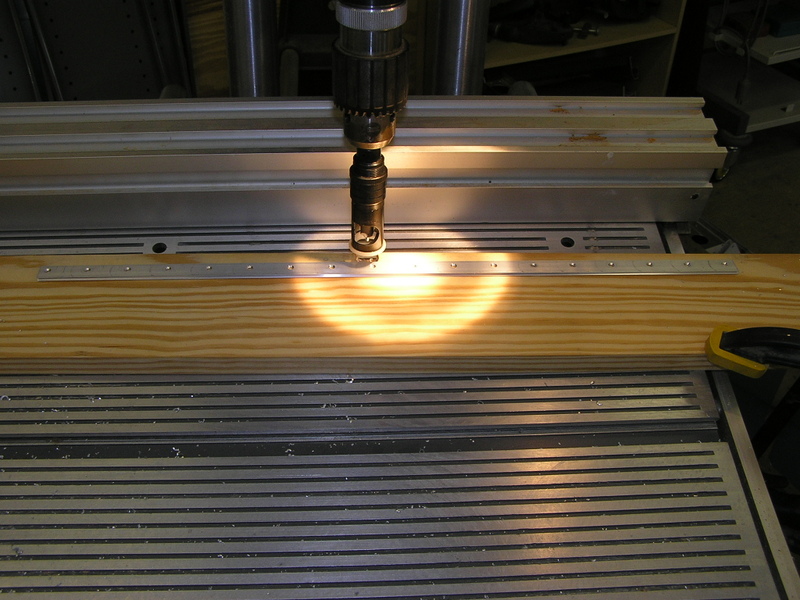 I used a 1/4" reamer to finish the hole to final size. 4/12/06 Countersunk/dimpled the trim tab cover plate platenuts and primed. Countersunk the elevator trim spar. I fabricated a mold using the dremel tool to hold the platenuts while countersinking. 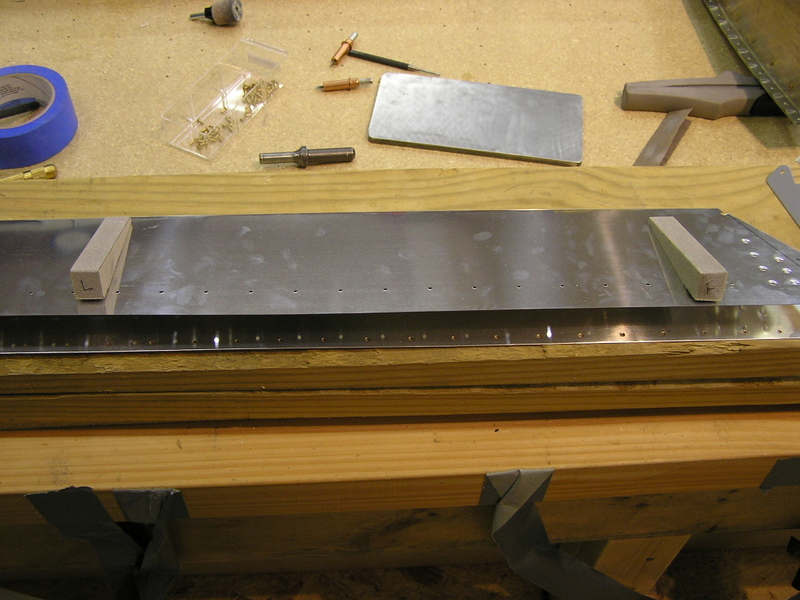 4/13/06 Countersunk/dimpled the trim tab spar. Deburred the electric trim brackets. 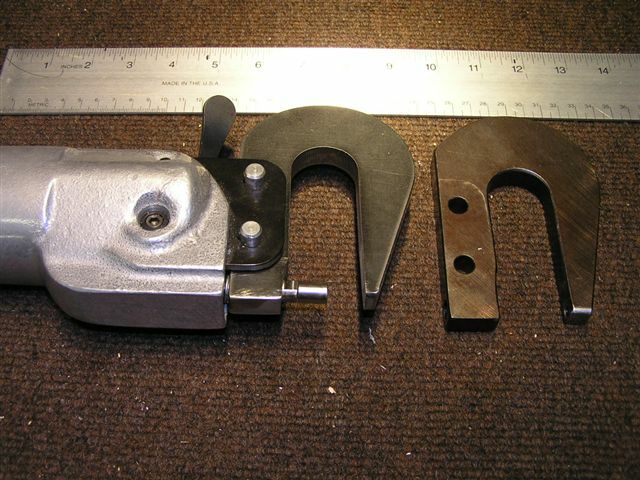 I received a 3.5" no-hole, thin-nose yoke from a machinist in Canada. It fits my pneumatic squeezer so I can now reach more rivets and those in tight places. 4/15/06 SanChemed the spar, ribs and assorted parts. 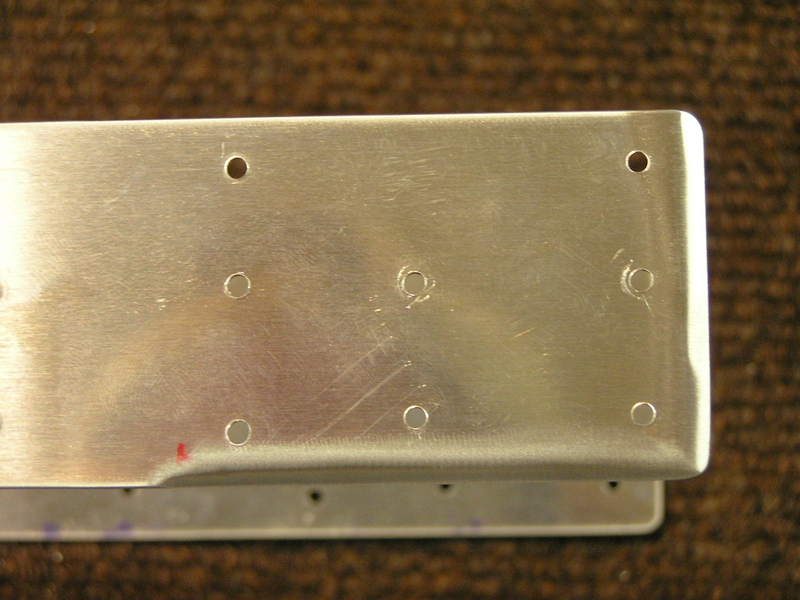 Riveted the platenuts to the trim support plate. Dimpled skin with Lynne's help. Riveted the spar, control horn, support brackets and counterbalance assembly. 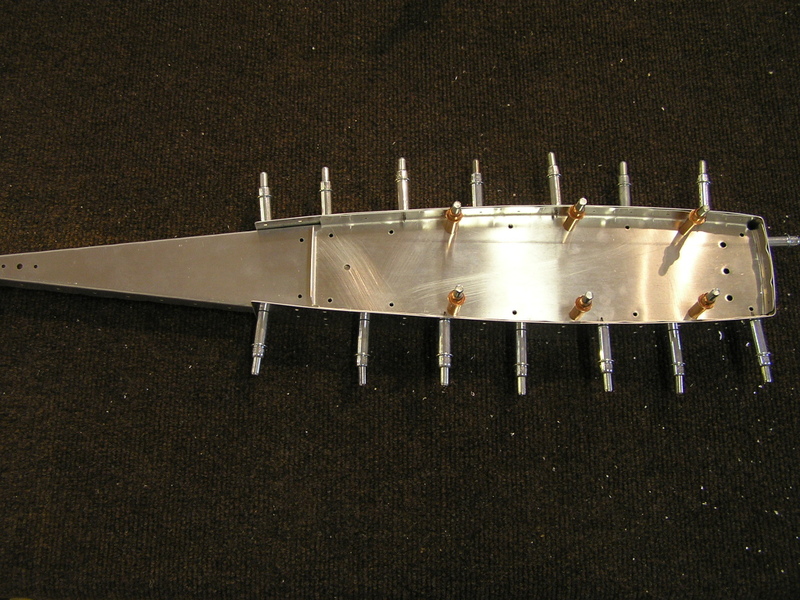 Back-riveted stiffeners to top skin. 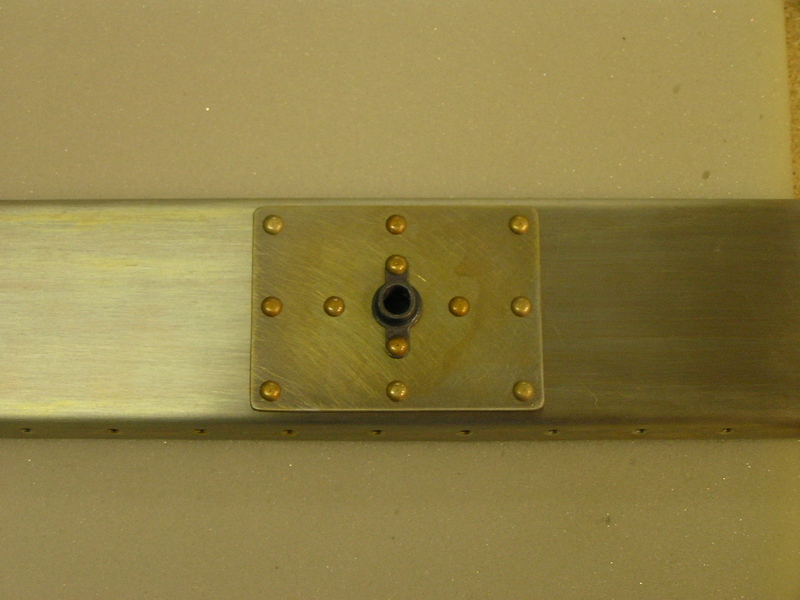 Began riveting spar to top skin. 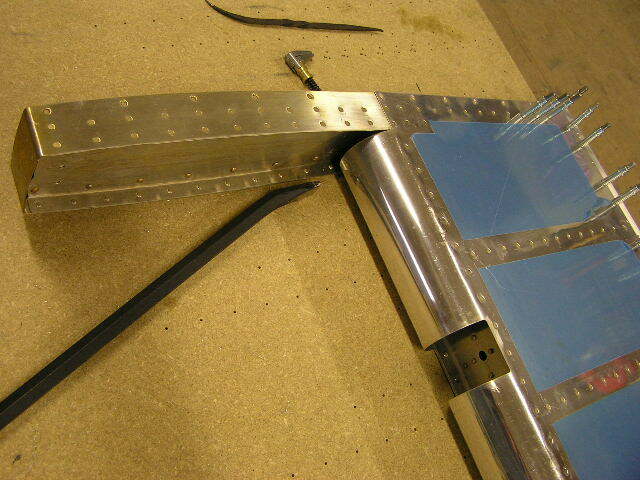 4/21/06 Riveted the bottom skin to the spar. 4/22/06 Countersunk the AEX wedge and Sanchemed. 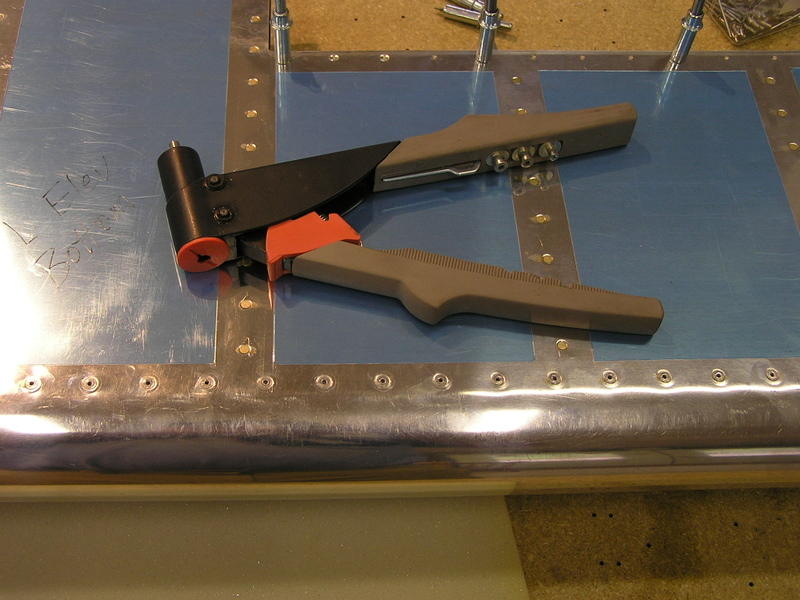 I used T-88 epoxy to glue the AEX in the trailing edge assembly and clecoed for setting up. I'll let it set for a week to cure and finish riveting. 5/7/06 Trimmed the lead counterweights for both L & R elevators and attached/torqued bolts. 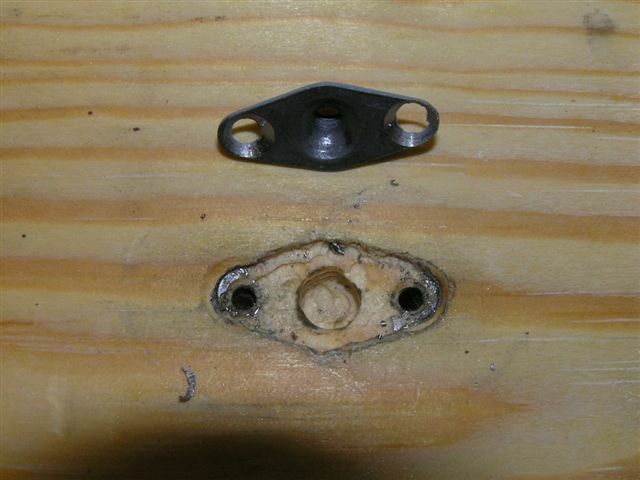 Installed the inboard rod end bearing but could not get the outboard bearing to start in the nutplate. 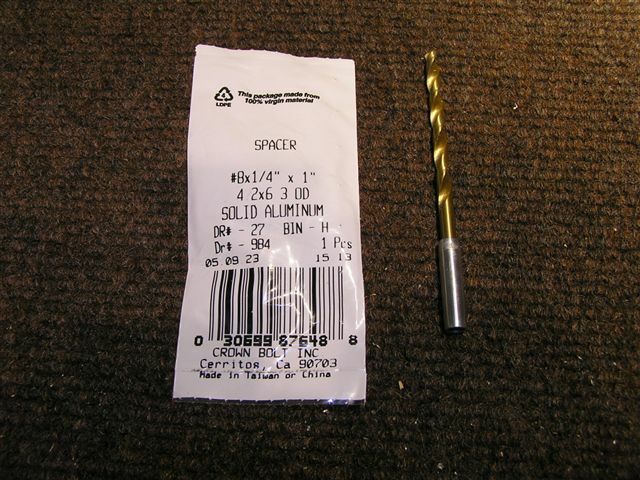 Instead of forcing the bolt and possibly stripping the threads, I will buy a 3/8 tap and see if that helps. Installed the trim tab servo and attached the cover plate. 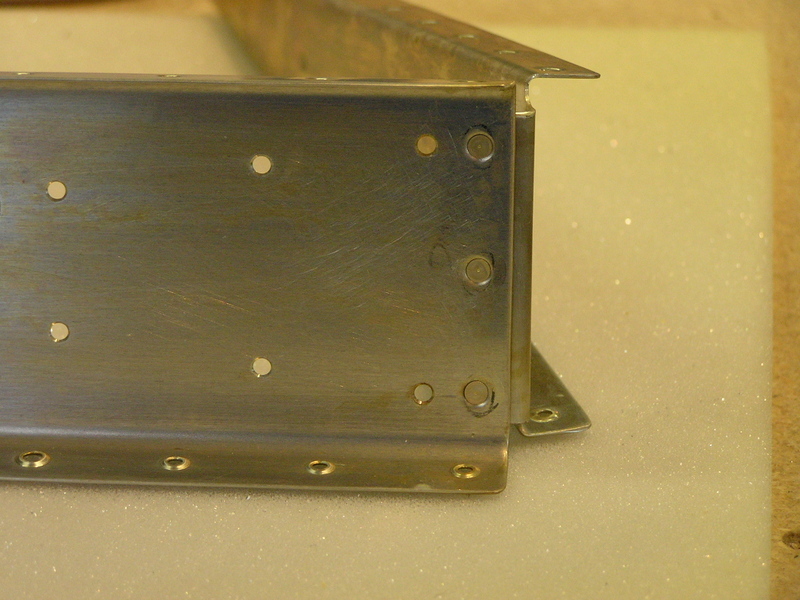 Riveted the trim tab hinge to the trim spar. 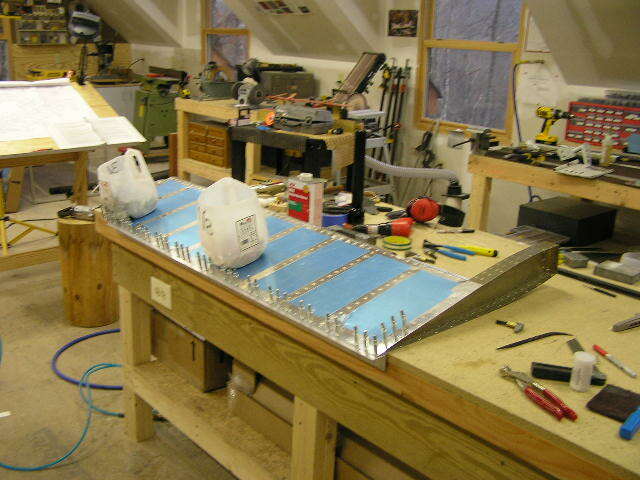 4/22/06 I cut the foam stiffeners on the bandsaw using the template in the plans. I finished the stiffeners on the belt sander. I taped off the area for the stiffeners and scuffed with 150 grit emery cloth. 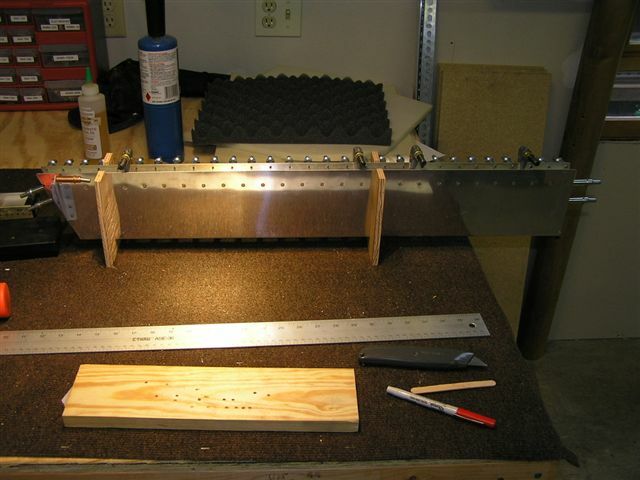 I bought four hinges from Ace Hardware and Aircraft Supply and constructed the bending break per the plans. A large part of the day was head-scratching. The plans really get thin in the detail area here. 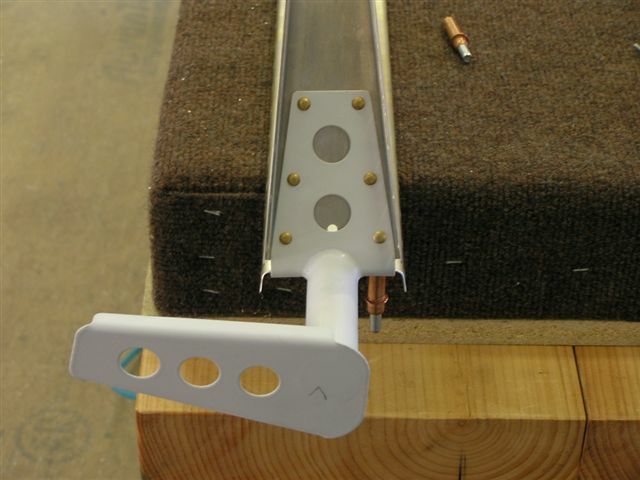 They say to drill, deburr, dimple and rivet the trim tab attach bracket and THEN bend the end tabs. 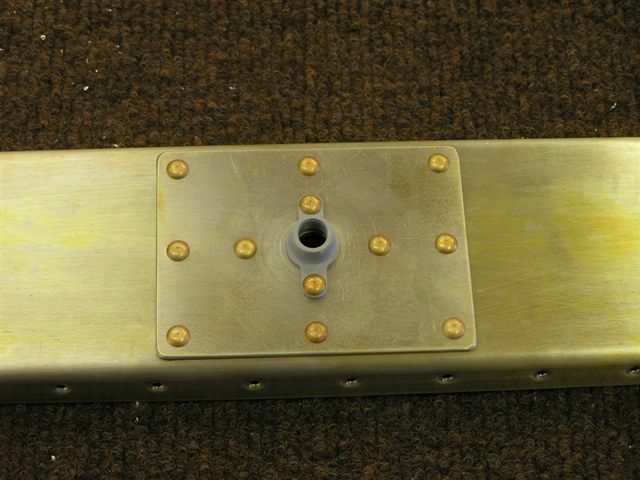 The problem is that you then CANNOT get the bending block in the correct position so I drilled out the rivets, bent the tabs and then re-riveted the attach bracket. All in all, I think they came out great. 5/5/06 Happy Cinco de Mayo! To celebrate I ordered my WINGS! 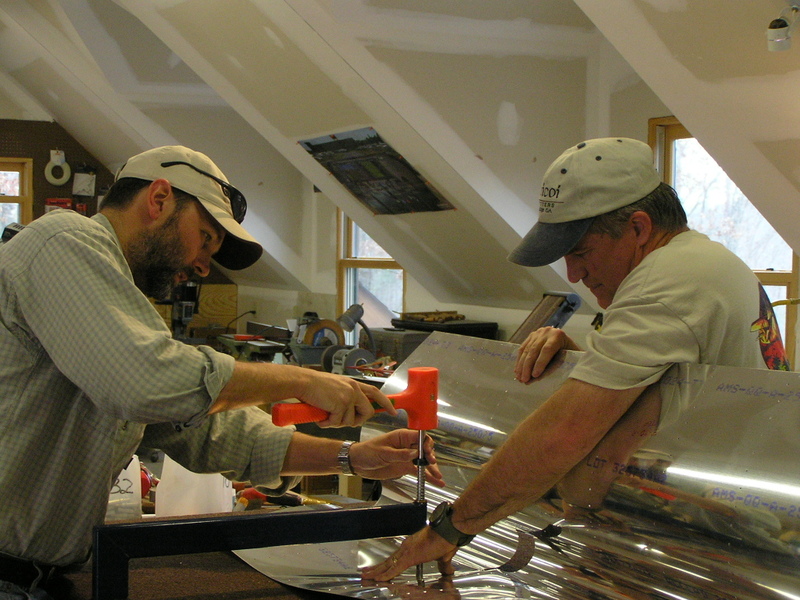 5/7/06 Backriveted the trim tab spar to the skin. I decided it was time to waste an entire tube of Proseal just to get a dab for the foam ribs. 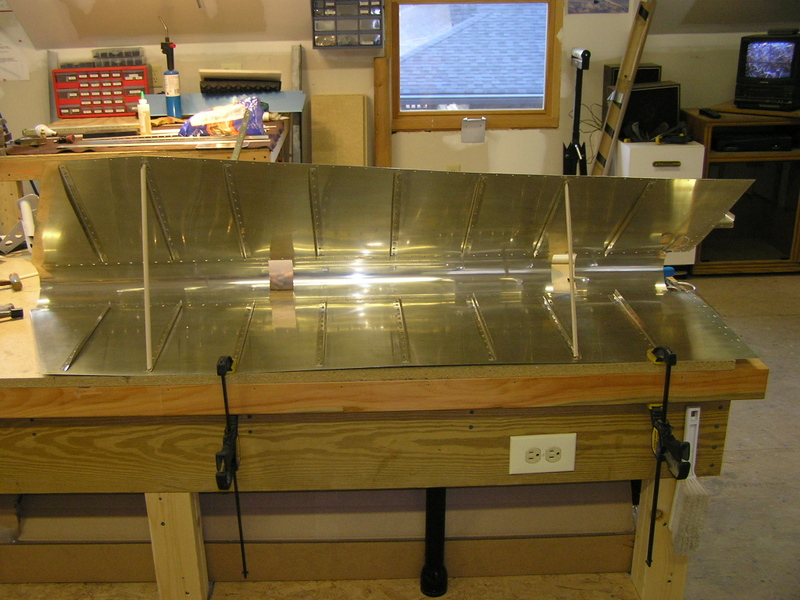 Once "dabbed" I set the trim tab in the "V" supports and will allow to set up for the next week. I match drilled the trim tab ends to #30 and pop riveted. Used the rattle can and primed the hinge. 5/21/06 I broke the hinge pin while bending it so I will need to order another one from Vans. I trial fit both elevators and checked for deflection. Drilled the horns. Began fitting the fiberglass tips. 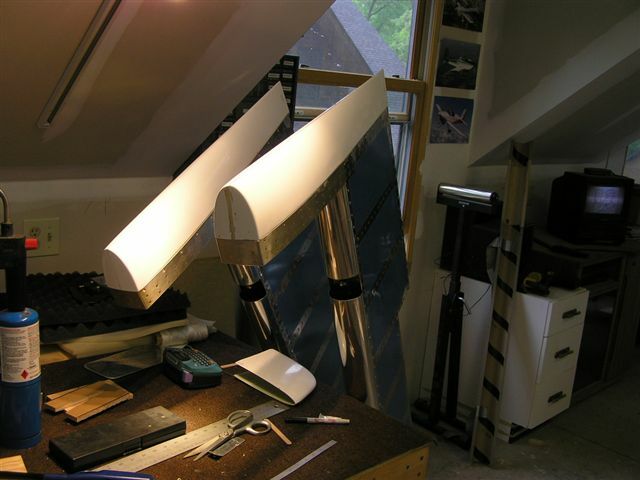 6/3/06 I've been notified my Wings will be shipped on or about July 10th so I have decided to go ahead and delve into the fiberglass and get this knocked out. I spent most of the day sanding the rough edges and trial fitting the tips. 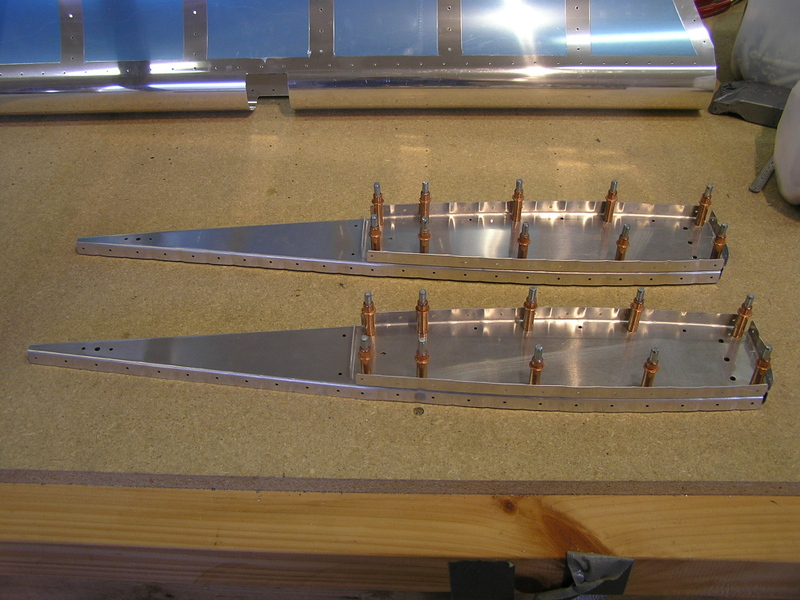 I will be installing nut plates on the vertical stabilizer tip as well as the rudder bottom. 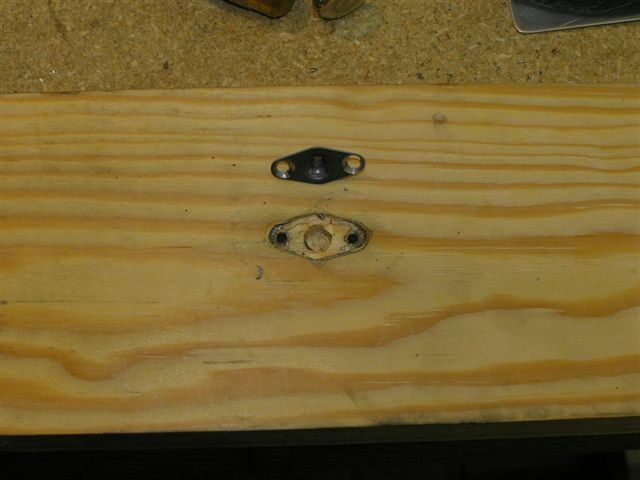 Everything else will have countersunk pulled rivets. I started with the rudder tip. 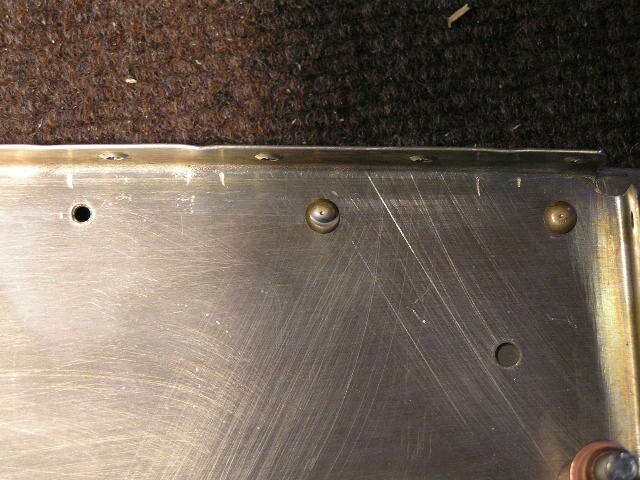 These I riveted with CS4-4 pulled rivets. 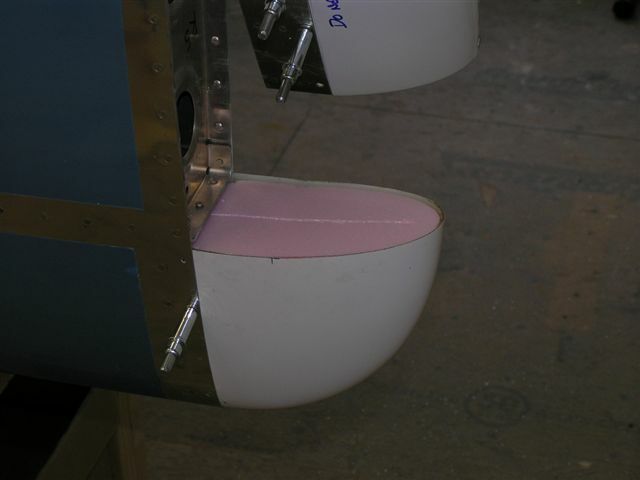 The Vertical Stabilizer tip. I will be making a plug to close the tip with some closed-cell foam I got from fellow EAA 1211 member and RV-4 builder Clay Smith. 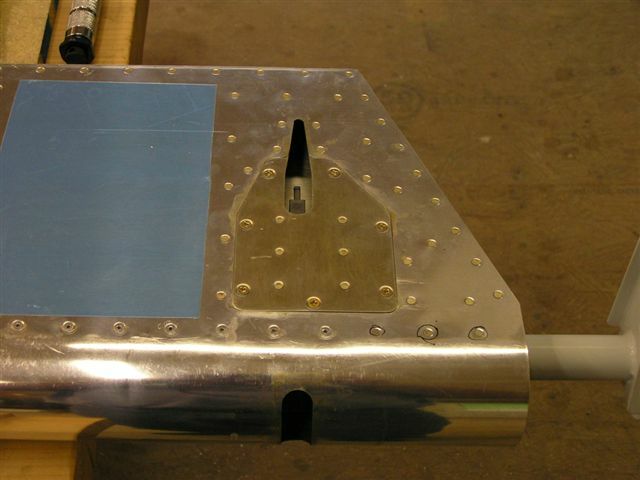 Next, the Rudder bottom. This required a special cut in order to fit the fiberglass over the control arm. After cutting a template out of cardboard and trial fitting, I transferred the lines to the fiberglass. The Dremel tool does a great job of cutting the fiberglass tips. I'm not really happy with how the fiberglass "bulges" around the front spar and I will be checking with a few other builders to see how they dealt with this problem. 6/4/06 Today I worked on the Elevator tips. After trimming and sanding they fit pretty well. 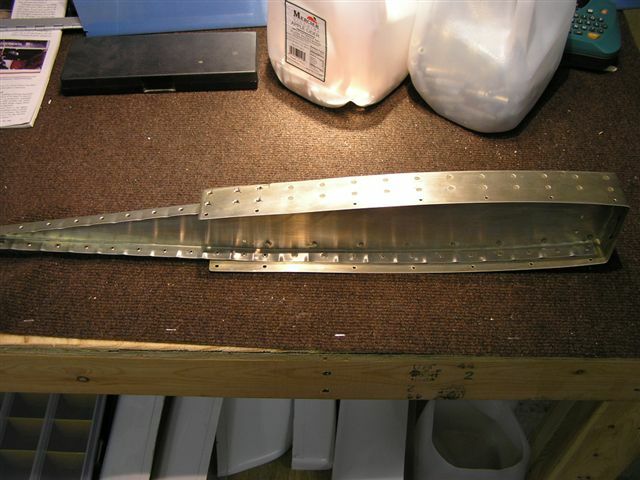 I made sure to note to myself NOT to rivet these tips until I fit the empennage to the fuselage and paint the elevators. 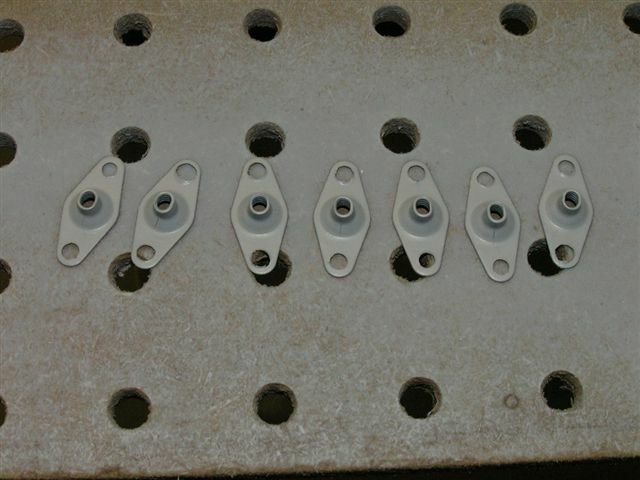 They cover the counterbalance lead weights which will need to be accessible. 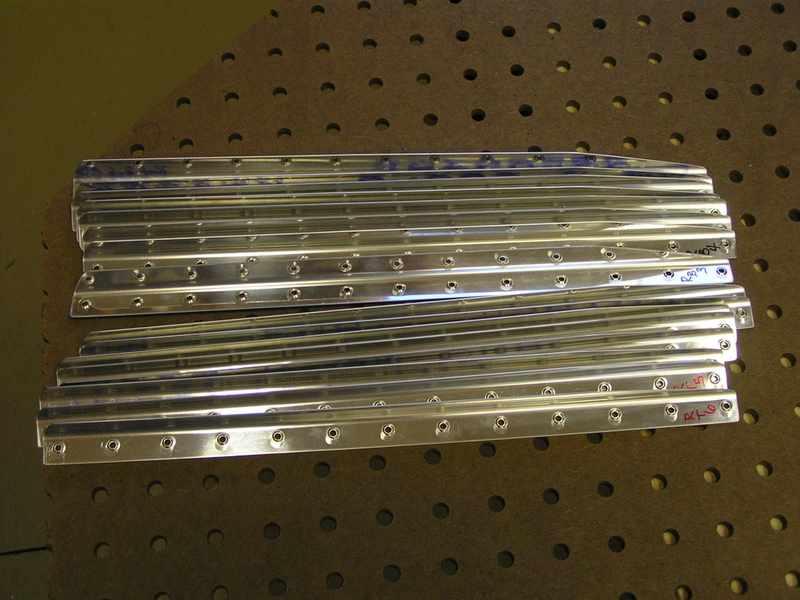 Next, I measured, marked, cut, (repeat) the Horizontal Stabilizer tips. I'm pretty pleased with how these tips look. Now all I need to do is fill in the tips which need glassing.... Otherwise known as the "fun" part. 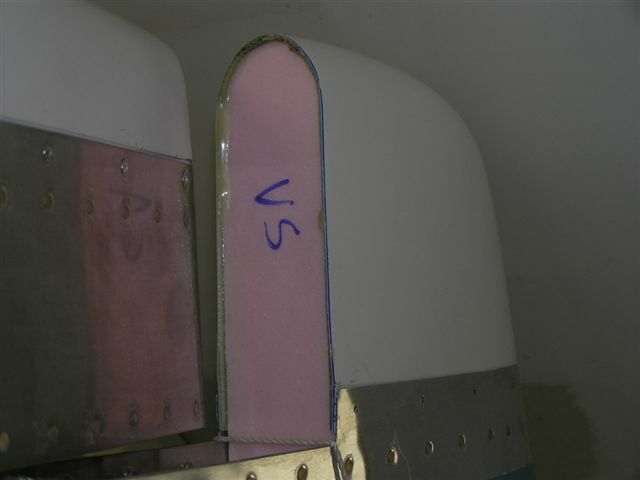 6/9/06 Cut foam pieces to plug fiberglass tips in HS and VS. Epoxied in place with T-88. 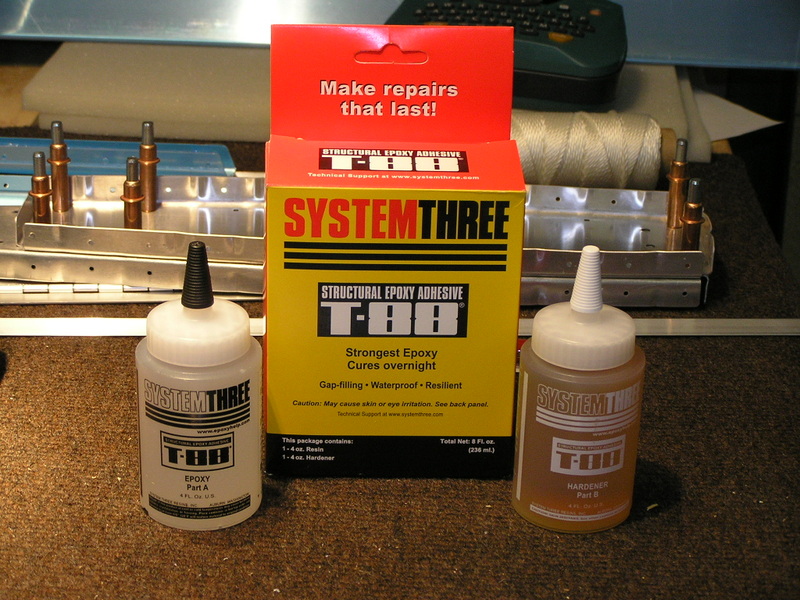 6/11/06 Received my West epoxy and hardener. Glassed the foam in the tips and then epoxied with a slurry of micro balloons. 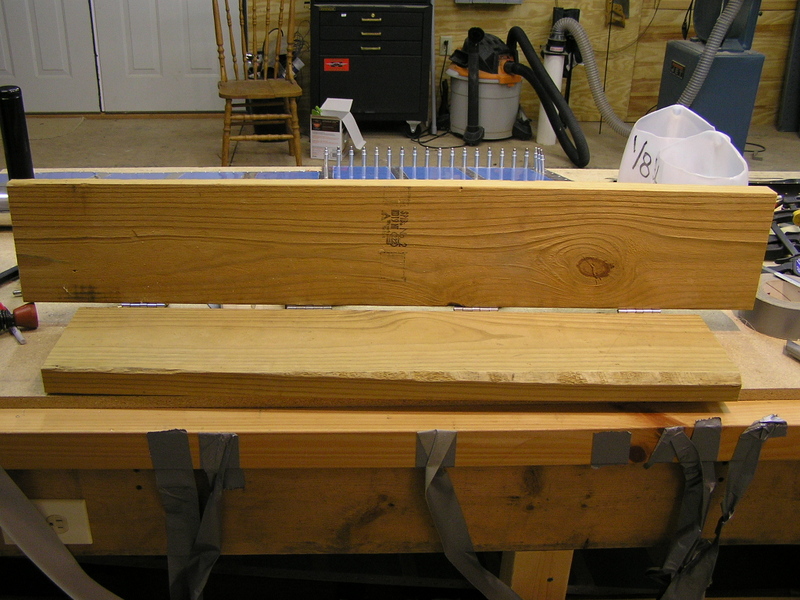 Began the sanding process once cured. I'll need to epoxy again and then sand to final surface coat. 6/12/06 Gave the tips a second lay-up of epoxy and balloons. A little sanding and I think they will do just fine. 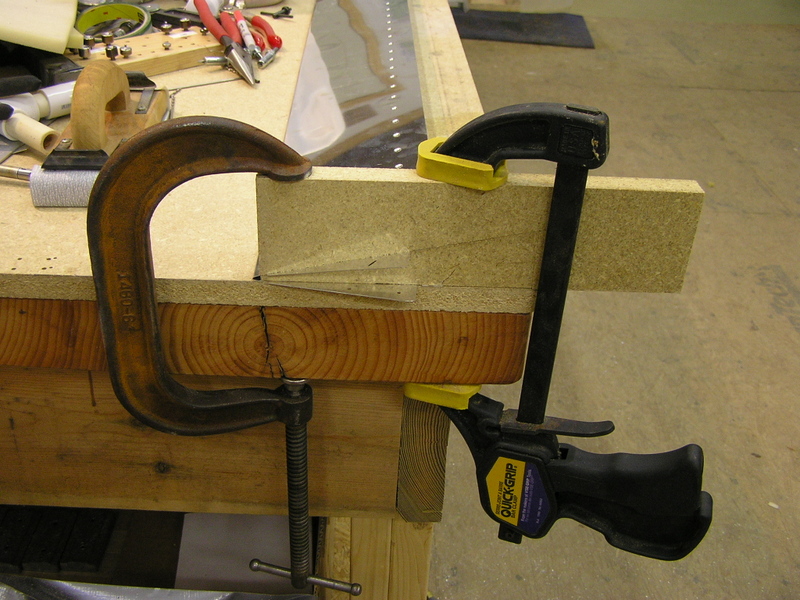 5/6/07 I decided to mount the delrin rudder stop I bought from Jeff Bordelon in Round Rock, TX. This thing is so simple and elegant. 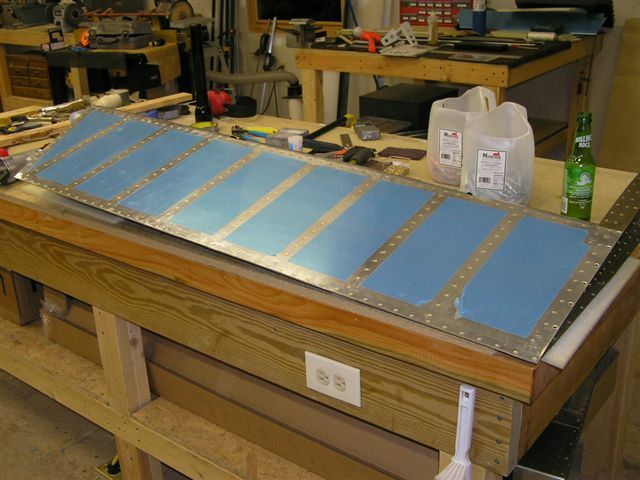 11/14/08 I re-installed the horizontal stabilizer and vertical stabilizer and rudder in order to finish up some last details. I started by trying a method of fiberglassing the HS ends which are exposed. It has always bothered me to see RV's with the holes in the ends of the HS. This would be a perfect place for birds or wasps to build nests. I cut a template out of styrofoam sheet and after taping off the HS, laid up two layers of 12oz. 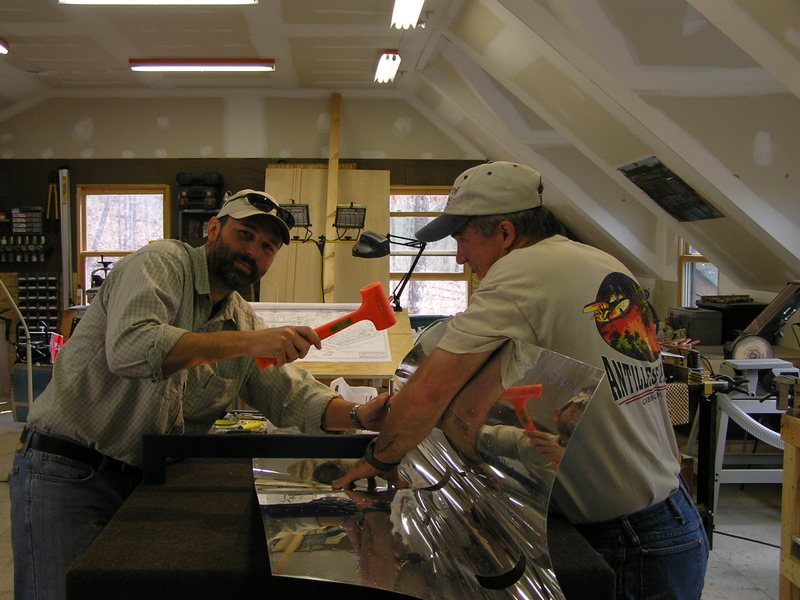 glass with the template mashing it in place. I am hoping to create a "reverse" glass cover of sorts. We'll see how it works. 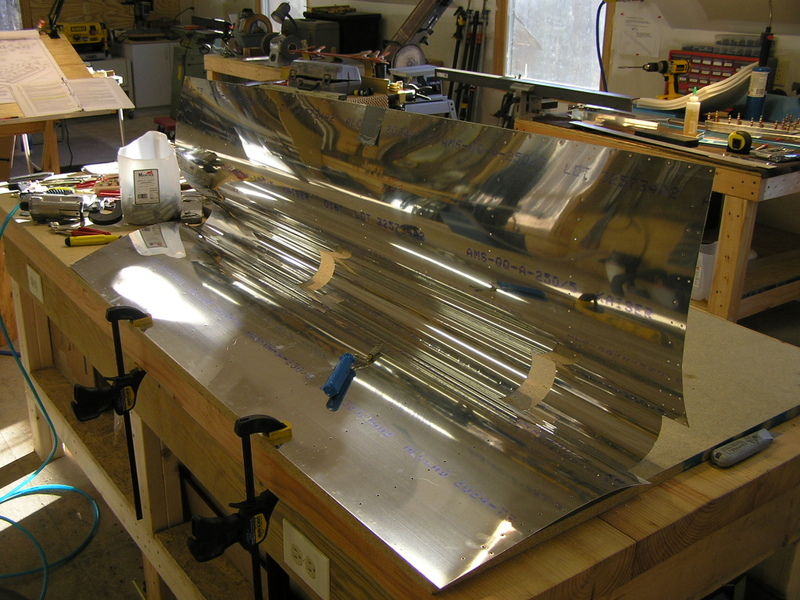 After the epoxy had set, I popped the cover off the styrofoam template and laid up another fairing for the right HS. I also temporarily installed the empennage fairing I got from Fairings-Etc. 11/15/08 I poured out some straight epoxy onto some sheet plastic and laid the molded glass into the epoxy "bed" to try and get a smooth outer surface. I also trimmed the flanges to .5". 11/16/08 I mixed up some thickened micro and put a finish skim coat on the left cover and set the right cover in the epoxy for setting. 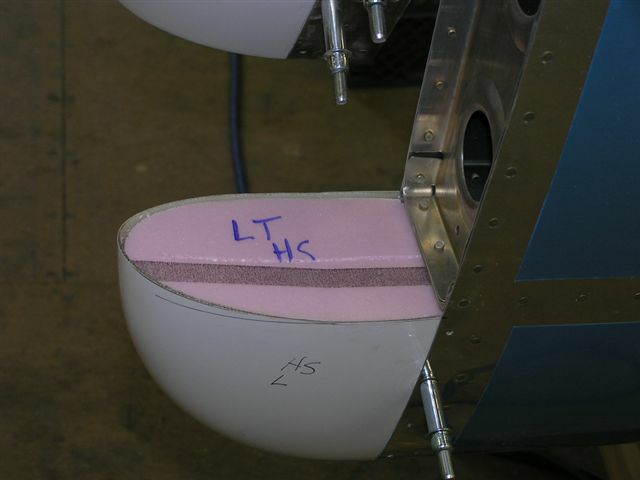 11/27/08 Riveted the cover fairings to the HS tips. 11/30/08 Installed the LED taillight in the lower rudder fairing and ran the wiring out. 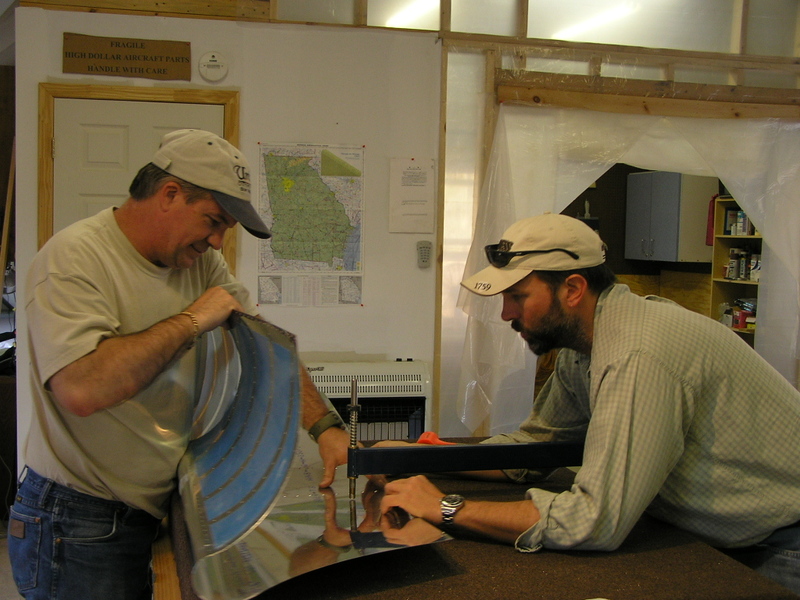 12/5/08 Began working to fit the empennage fairing. I used the Dremel to sand away some epoxy overruns until it fit better. 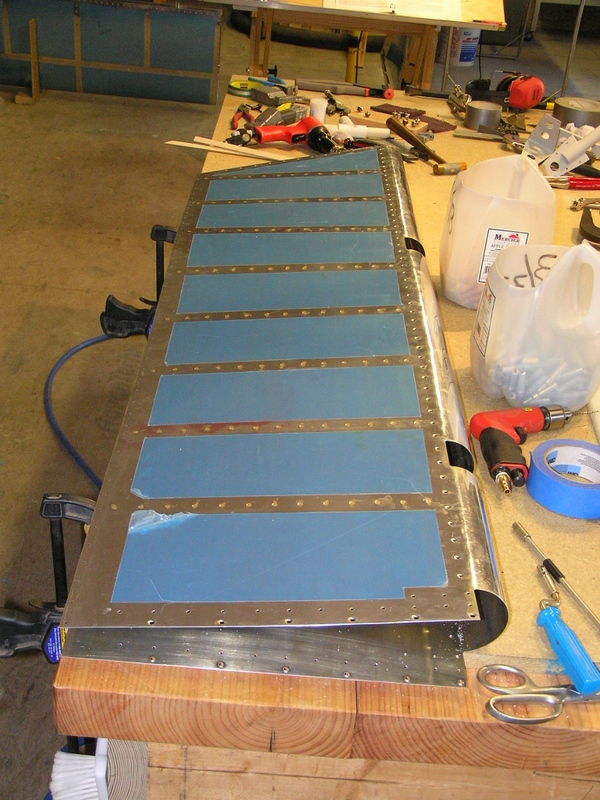 I then drilled the fairing to the holes in the HS and Vertical stabilizer. 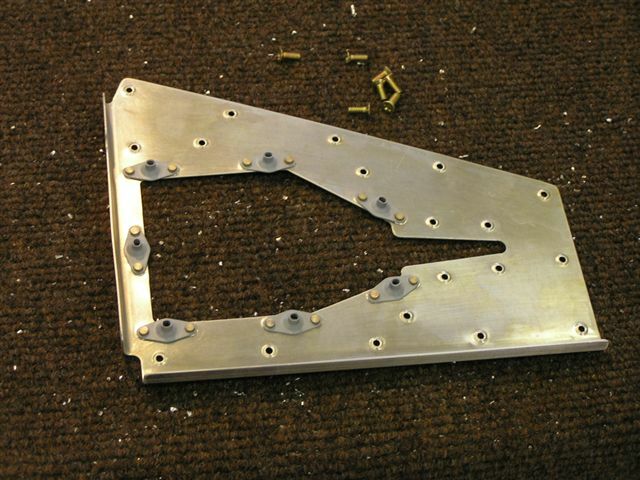 12/6/08 I drilled the fairing holes to #30 so I can tap the longeron and install #8 screws.